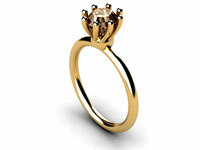 We are one of the UK's leading engagement ring designers. Every ring we make is completely unique to each individual client's personal style. Also, we can work to your individual budget so you feel completely comfortable at all times. Atelier is run by Vanessa Frisbee, a well known jewellery designer and expert jewellery historian. Her wide ranging experience means she can help you with any design from the ultra contemporary modern to rings based on a Roman or Greek design or any vintage style, or the most unusual engagement rings you can imagine based on your own design ideas. Why choose a bespoke engagement ring? It's simple really. Often, bespoke made rings, weight for weight, don't usually cost any more than mass produced rings commonly seen in a high street jewellers' windows. However, if you have a bespoke ring, you will certainly get better design and you are far more likely to get better quality. 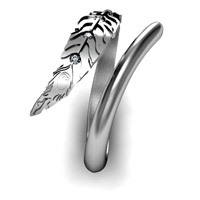 More importantly, this is the ring you will wear all your life - shouldn't it be perfect and original, just like you? We believe that you should have EXACTLY the engagement ring you want. Its your celebration of love. Make it unique ! You want an engagement ring that is a little bit more unusual than you see on the high street but you don't have a clue where to start. We can help you by taking you through the process of defining and consolidating your thoughts into a design for an engagement ring which will be one of a kind, unique and special to you and NEVER repeated - and that's our guarantee to you ! With several thousand engagement rings and unparalleled expertise in design and knowledge of jewellery styles to our name, we have the ability to literally make your dream ring for you. The thing to remember is that traditional ideas don't have to constrict you in any way. 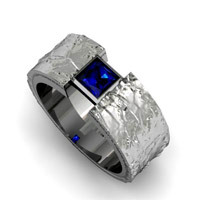 For example, engagement rings don't have to be all about diamonds. Within reason you can have any stone you choose (although we'll advise you if a stone is not hard enough to withstand daily wear or is unsuitable in any way). 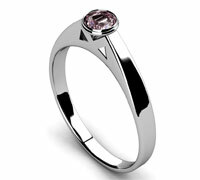 METAL: Another important consideration for your choice of engagement ring is metal. Your choice of metal will be down to colour preferance, durability and budget. See our metal guide for the main types of metal used in jewellery, along with some basic facts about them. You want diamonds? 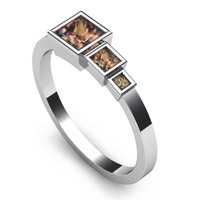 Choose from white or "fancy" diamonds in yellow, pink, brown, black, blue, orange, green or even purple. Don't like modern cuts ? No worries - we have cutters who can produce traditional or more subtle cuts such as rose cut, or be daring and choose an engagement ring set with an uncut diamond in its natural state. Now there's a question we get asked a lot. Various aspects of tradition dictate that you should spend at least one months salary, some say two or three months. We say, spend what is right and comfortable for you. Getting engaged is a time to celebrate, not be worrying about how much you've run up on your credit card. We've made engagement rings for as little as £250, and we've also had customers who have spent into the high thousands - which ever it is, remember, its the sentiment behind the ring that matters. 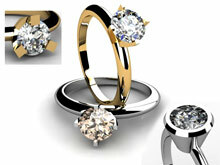 Some couples even opt for simple silver engagement rings more in keeping with a "credit crunch engagement". So whatever your budget, talk to us, we can help you find the perfect solution. With us, the world is your oyster - all we ask if you guide us along the way so we can produce the engagement ring of your dreams. Most of our clients arrive at our door when they have exhausted all other avenues. They have tried traditional jewellers, and even been to see other jewellers who specialise in bespoke wedding and engagement ring design and drawn a blank. Why? Nearly all jewellers who design inhouse still rely on hand drawn images to show you how your finished commission will look leaving a gulf between their drawing and your dream. Whilst we too can draw designs by hand, our mastery of state of the art CAD/CAM (computer aided design /manufacture) technology leaves nothing to your imagination. Using our design knowledge and expertise we can create, with ease, jewellery that many other master goldsmiths would find extremely challenging or impossible. And most importantly, before we've even sat down at a jewellers bench to start you commission, you'll have seen beautiful photographic quality images of your piece which will only be bettered by the real thing. You might think this sounds expensive, but actually it saves our time and resources and in turn saves your money. Additionally, you might be told by some bespoke jewellers that CAD/CAM is not used by real jewellers - anyone who tells you that "CAD is great for companies that only use pre-cast parts" is simply trying to hide behind a veneer of misunderstanding and fear. 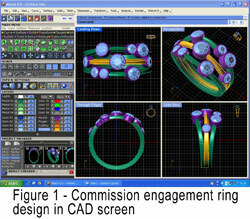 CAD/CAM systems are used by many of the worlds major high quality jewellers. The learning curve to using this technology is very steep and not many can achieve the expert level of skill that we have developed. Also, these extremely complex systems do not use pre-cast parts - all of our designs are drawn, if you like, not using pencils but using a mouse, entirely from scratch. 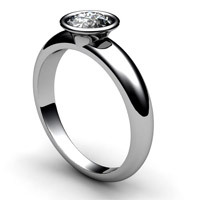 Whilst we are more than happy to design a bespoke ring for you, we also encourage you to come to us with a ready designed concept of what you want. We've seen rough sketches on scraps of paper to plasticine models - anything you can put together works to give us a clearer concept of what you want. 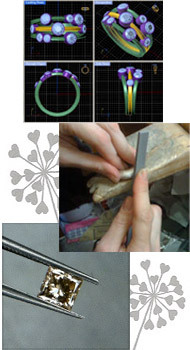 Whatever happens you'll be advised and involved with the design and manufacture of your bespoke ring all the way along. Clients sometimes ask if they can come in and watch their ring being made - we normally gently suggest you don't do this as making your ring may take many hours, but we will ask you to come and sit at the gallery whilst we put the finishing touches to your bespoke design. This may take some time, depending on the complexity of your design, so we will always keep you refreshed with a selection of organic teas, coffee, hot chocolate or any thing else that takes your fancy! A couple came to see us for an engagement ring which they wanted to act as both engagement and wedding ring combined. Following initial direction from the couple which, in this case, involved them showing us pictures of rings they liked from magazines and from the internet, we discussed the possibilities of how the ring might look. As there was to be no traditional style wedding ring, we suggested three separate bands combined in the same shank symbolic of an engagement ring, a wedding ring and an eternity ring. 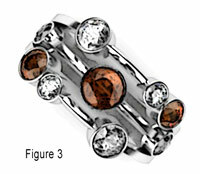 They liked this idea, but wanted to include lots of diamonds in the design, and two colours of metal. 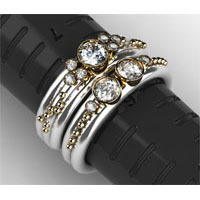 We sourced three sets of white diamonds which were matched to the exact sizes in the ring design. A group of DEF VVS (high white colour, very very slightly included) diamonds were selected by the clients with our help to complete the ring to the best possible quality within the budget. 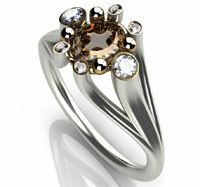 We also sourced about 30 examples of natural fancy cognac diamonds directly from one of our suppliers in Antwerp. We advised that choice should be made on colour (in this case red brown) and intensity of colour. Three diamonds, a 0.41ct for the centre stone, a 0.23ct for the top right in the picture and a 0.13ct for the bottom left, were selected. Tension set 0.7ct VVS white diamond solitaire in a double shank platinum engagement ring designed to the customers specifications. This contemporary solitaire engagement ring was designed around the customers own 0.2ct pink diamond bought from the Argyl diamond mine in Australia. A solitare diamond set in an open wrap around setting. 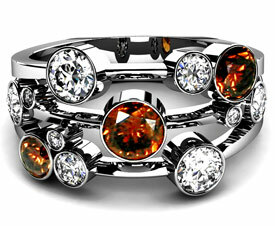 This design used a 0.33ct diamond in 18ct white gold. We make bespoke solitaire engagement rings to specification in any metal and any design, claw, bezel or any other unusual setting. 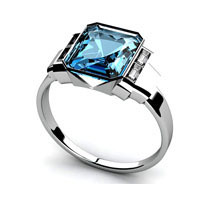 We will supply the gemstone that you want or we will set your own gemstone. Atelier supplies ethically sourced metal and guaranteed conflict free gemstones - see our metal and gemstone guides for more information. As we make everything in house, we can beat any high street price and usually supply better quality materials and gemstones at the lower price. 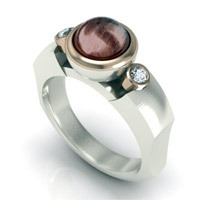 Commissioned three band contemporary engagement ring; 18ct white gold outer bands fused with 18ct rose gold centre band with a 0.07ct cognac diamond bezel set in rose gold as the centre stone and two flanking bezel set 0.03ct white diamonds. 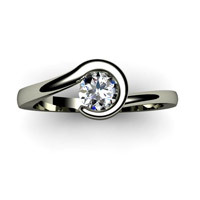 This 18ct white gold contemporary engagement ring was made as a special commission. 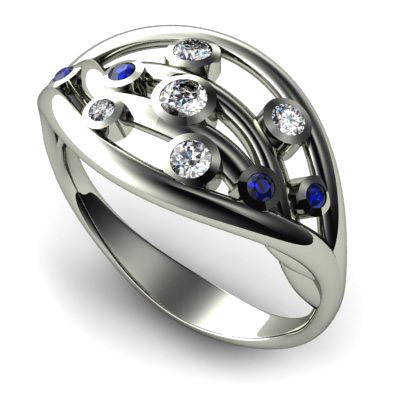 A series of organic "branches" were created and then diamonds and sapphires were set within the branches. These unusual coloured diamond engagement rings were made by us in a limited edition of five - 2 in 18ct yellow gold, 2 in 18ct white gold and 1 in platinum. Three colours of diamonds, white, canary and champagne were used totalling 0.93ct all set in soft cup shaped bezels. A very unusual engagement ring with a 5ct rough balas (ball) diamond set in 18ct rose gold flanked by two brilliant cut diamonds set in rose gold. The main ring shank in 18ct white gold, a solid 17g worth without the stones. We were asked to design and mount several diamonds from three old rings belonging to the client into a engagement ring and matching wedding ring to be worn as a pair. 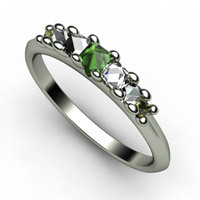 She specifically wanted a bespoke design like a ring in the shop that had gold balls melted into silver. 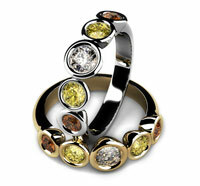 These rings were hand forged in silver, with 18ct gold balls on them and the diamonds set in 18ct gold bezels. She never did decide which was the engagement ring and which was the wedding ring! Two amazing bespoke rings made for an African politician and his wife. 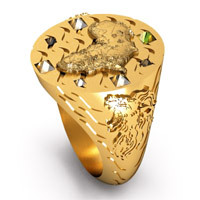 the ladies ring called "African Sunset" in white gold and the gents signet ring called "Lion Of Africa" in 22ct gold. 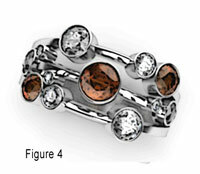 These rings feature 14 rough diamonds ... read on for more information. These rings came about since we have become involved in a programme set up by one of our friends, a diamond collector and dealer, who in his work visits some of the war torn areas of North East Africa. He was so moved by the plight of the villagers following the civil war in Sierra Leone, he set up a charity and has provided some of his profits towards a school and the local football team for the villages that were disrupted by the RUF during the occupation of the diamond mines and forced working regimes in the area. His efforts have been recognised by the now stable government in the region and prompted a visit to the school by a member of the government. The villagers wanted to make a gift of some small rough diamonds to him and his wife during their visit (properly certificated through the Kimberly Process prior to making the gift) which our friend offered to make into rings for them. He asked us to make two rings using the stones which would be special - and upon hearing the story, we we we of course charged no fee for the designs which were finished by African craftsmen, our friend providing the resources for their manufacture. It is our intention to add a section to this site for rough diamonds so the charity can be serviced by the sale of these amazing stones to the public under the banner "Not Rough Trade"
This engagement ring / wedding ring set was made to the customers own specification in 18ct yellow gold (outer bands) and white gold (centre band and bezel) with a 0.65ct VS white diamond which we supplied. Just before the wedding, the customer came back and commissioned the two separate 18ct white gold wedding rings which fit either side of the engagement ring to make it a 5 band engagement-wedding ring set. It is believed that the ancient Romans began the practice of placing the engagement ring on the left ring finger, which they thought contained the “vena amoris” or vein of love which supposedly connected directly to the heart. The Romans gave rings as a token of affection, and this may also have contributed to the act of giving an engagement or betrothal ring. The Romans held that Marriage essentially transferred a woman from the authority of her father or male head of the family (pater familias) to the authority of her husband. In theory that control extended even to life and death, but in reality it was limited to economic matters. Any dowry brought into the wedding was then the property of her husband, so a wedding, betrothal or engagement ring effectively "sealed" the bargain between the two parties. 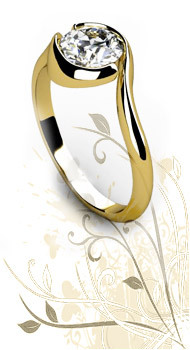 A ring may also have formed part of a bridal price or dowry. Other ancient cultures, including the Egyptians, also used the Roman symbolism of the left finger - and even today the tradition persists both with engagement rings and wedding bands. 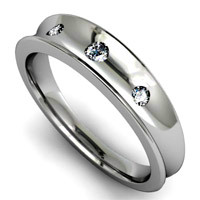 In fact, wedding bands are placed first on the left ring finger to be closest to the heart. The first recorded diamond engagement ring was exchanged in 1477 when Archduke Maximillian presented the token to his betrothed Mary of Burgandy. Prior to that event, engagement rings were either plain metal bands (iron for commoners, while gold and silver were used among royalty) or used less expensive gems. 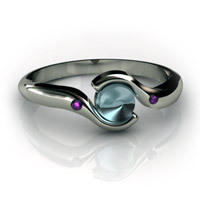 Engagement rings are ultimately circles of metal, and the circle is a part of very sacred, symbolic geometry. Circles have no beginning and no end and thus represent eternity, renewal, wholeness, and perfection. 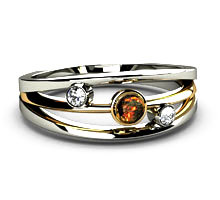 They are also symbolic of the sun, moon, and planets, bringing together all life just as an engagement ring brings together the lives of two people. These days we formalise an engagement with the exchange of a ring. Traditonally we might choose a solitare, but now there are lots of other choices - the world is your oyster when it comes to design and stone selection. In fact the most difficult decision you'll need to make is deciding what beautiful ring you want to spend the rest of your life with ! !